A couple of weeks ago, I was sitting on the runway at the Pierre Elliott Trudeau International Airport in Montreal ready to embark on an adventure to Peru – a journey I had waited to take my entire life – and I was so excited. What would I see? Would it be as great as I’d built it up to be? Where. . . wait . . . where were the TVs on this plane?! [Insert Face Screaming emoji]. Was this the Stone Age? What did they expect me to do for eight hours? I’m a Millennial after all – I need to be entertained! An overhead announcement informed me to download the airline’s app to access the inflight entertainment system. I fumbled through my over-packed carry-on at lighting speed, grabbed my dying phone and plugged it into the seat-charger. I looked at my phone eager for the charging symbol to appear – nothing. I plugged and unplugged it an embarrassing amount of times trying to remedy the problem before slumping back into my seat in defeat. “Please turn all personal electronic devices to airplane mode,” instructed the overhead voice. What was I supposed to do now? Talk to the woman beside me in my broken Spanish? No thanks. I gazed out the window and with a deep sigh accepted my fate. Now, as you probably have gathered, I survived the flight. And in case you’re wondering, yes, Peru was even more amazing than I thought it would be, but that’s not the point of this post. The point is that while this trip started out a little rocky, it ended on a very different note, and that’s because along the way I was reminded of something: the beauty of connection. We all long for connection, relationships, and acceptance. We yearn for these things because God created us for these purposes. 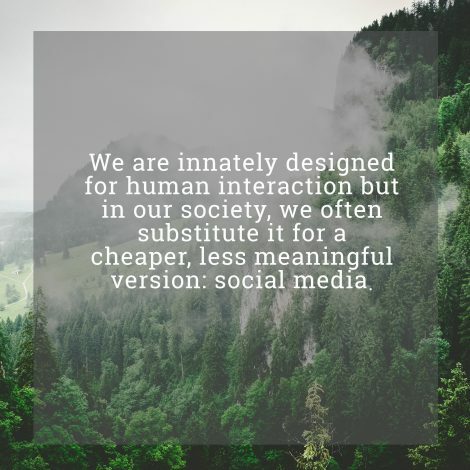 We are innately designed for human interaction but in our society, we often substitute it for a cheaper, less meaningful version: social media. Social media was designed to help us connect with one another, but in most cases it does the opposite. Even when we are out doing social activities, much of our energy is spent getting that perfect photo for Instagram or SnapChatting the entire activity, that we forget to enjoy what we are doing and appreciate those we are doing it with. The validation that comes with getting a lot of “likes” and “comments” on our posts feels great, but often we spend so much time looking down at our devices, that we end up robbing ourselves of the precious time spent with the people who are right in front of us. When I was in Peru, my phone didn’t have data so I didn’t have the option of “looking down” because there was nothing to look at. If I was on a bus, I talked to fellow travellers and if I was lost, I asked local shopkeepers for directions. It didn’t take long for this to feel natural. During my trip, I ended up dining and adventuring with strangers. By the end they were no longer strangers, but instead were people with names and stories. They were unique individuals who entered my life, some for only a few hours, others for a few days. None of these interactions were life-changing but they were life-giving and I think that’s because I was doing what I was created to do: building connections with others. At the beginning of my trip when I was sitting on that airplane in Montreal, I didn’t want to have a conversation in broken Spanish with the lady beside me, I wanted to isolate myself behind a screen. At the end of my trip, I found myself in a 45-minute taxi ride back to the airport with a taxi driver who also didn’t speak English. This time, I didn’t just stare out the window – even though it was 3:00AM and I wanted to do just that. Instead, with my limited Spanish I spoke with the man. I started with “hola” and by the end I had learned his name, how he had a brother and a sister, how he had to flee Venezuela, how he lived in Colombia for three years before Peru, and how he missed his country and his job very much. I can’t explain why this moment stuck with me so much but I think maybe it was because it was a real moment, a moment where I was fully present and fully listening to a stranger’s story. It’s in moments like this where life happens and connections are made. We do ourselves a great injustice when we hide behind our screens. So, if I could leave you with just one bit of advice it would be this: look up, talk to that stranger, be fully present with the people you love. I promise you, you won’t regret it.